PUCCINI's classic solid silver ties are also available as elegant cufflink sets. The polished silver metal body is paired with a fabric covering in satin. A great formal accessory that will dress up any French Cuffed shirt. 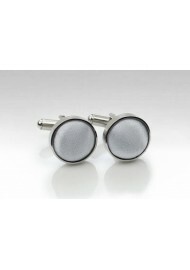 Wear with matching ties or ties in the silver - black color range.